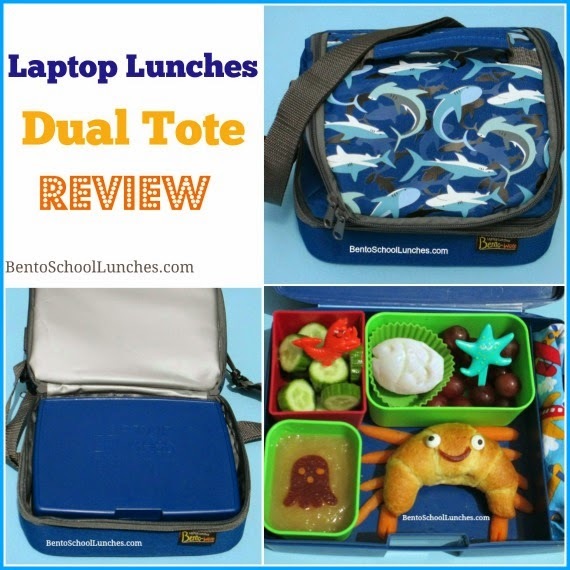 Laptop Lunches recently launched some new items and I am so happy to be given the opportunity to review their new Laptop Lunches Dual tote. I have received many inquires about how I transport the lunches I prepared to have an expectation that it will arrive without the food re-arranging itself into a mess by lunchtime. I have always recommended packing the lunch box tightly with food and into a lunch bag that will hold the lunch box flat while being carried. 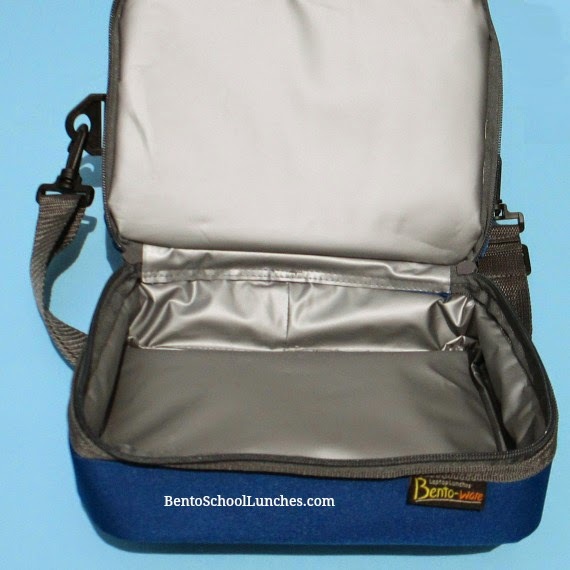 With this dual compartment tote you will be able to send more than just the Laptop Lunches bento box. With the large compartment on top there is quite a lot of room for an additional snack box, water bottle or more with the bottom compartment nicely holding your bento. I was quite pleased to discover that it could hold many of my other lunchboxes. Often there are days which include after school activities like field trips or sporting events for which an extra snack would be desired, and this lunch bag would be the perfect solution. 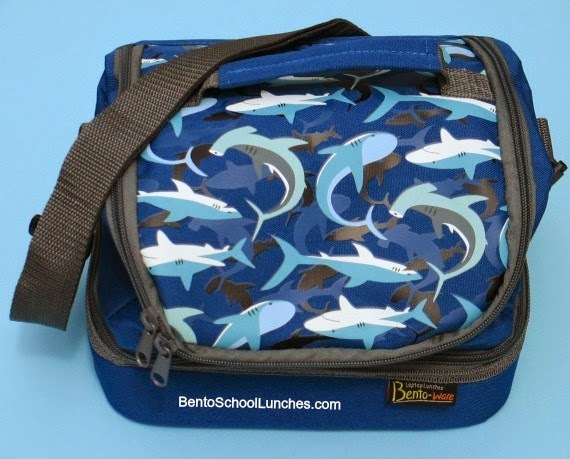 Here is the picture of the super cute shark frenzy dual tote which Nikolai selected. 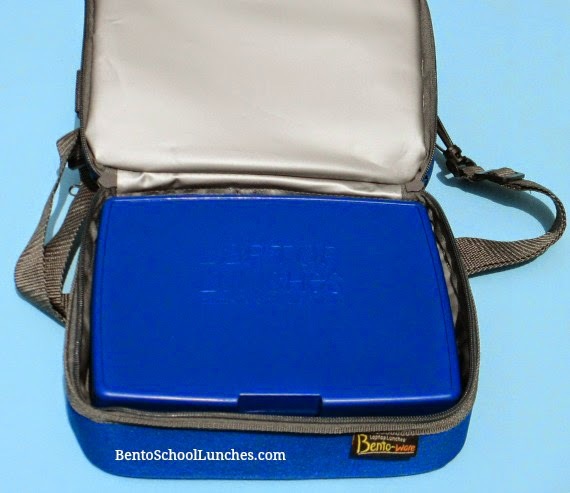 We love the color of the dual tote, it goes perfectly with his blue Laptop Lunches bento box. The quality is superb with zippers well made, as are the sturdy, well anchored carry handle on top and it even has a sling strap for when you have both hands full! As you can see from the picture above, there is plenty of room in the upper compartment, and also that it is fully insulated and easy to clean. Below is a picture of the lower compartment which has the same great features. Among its features you will find that its dual-compartment style is fully insulated, versatile, and food safe (contains no lead, BPA, phthalates, or PVC). It measures 9.5 x 7.25 x 7.25 inches and wipes clean with a damp cloth. 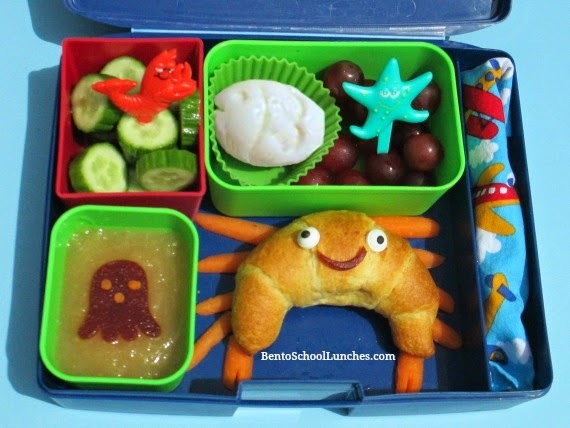 Here is the 'Under the Sea' bento which was a lot of fun to make. Crab made from mini croissant with legs and claws made from organic baby carrots and fruit leather smile between candy eyes. Lower left is a fruit leather octopus with carrot accents on applesauce. Upper left is Persian cucumber slices with a lobster pick. Upper right is fish shaped hard boiled egg in silicone cup and seedless red grapes with starfish pick. Far right is a spoon wrapped in cloth napkin. 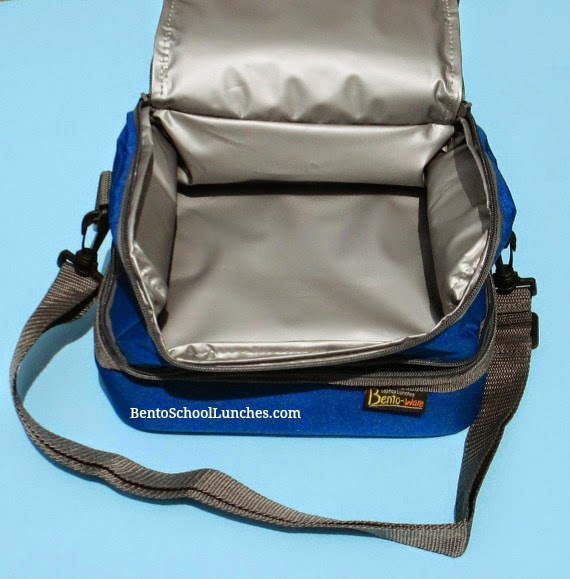 The picture below shows the Laptop Lunches bento box fitting snugly into the Laptop Lunches dual tote lower compartment. Overall, we love this well made, user friendly and versatile tote! I am sure I'll be using it very often for Nikolai's school lunches and snacks. Here are the supplies that I used to pack this lunch. Disclosure: Laptop Lunches generously provided me with the item for review without cost to me. Other than receiving the item, I have not received any compensation to write this review. Cute lunch and tote! My kids have the lunchboxes and I definitely need to get the totes for back to school! Such a lovely lunch! The tote looks nice! The tote looks good, thanks for sharing your views on it! Love the little crab! I'm absolutely enthralled with the new bags and can't wait to get my hands on one! Love the lunch, too!